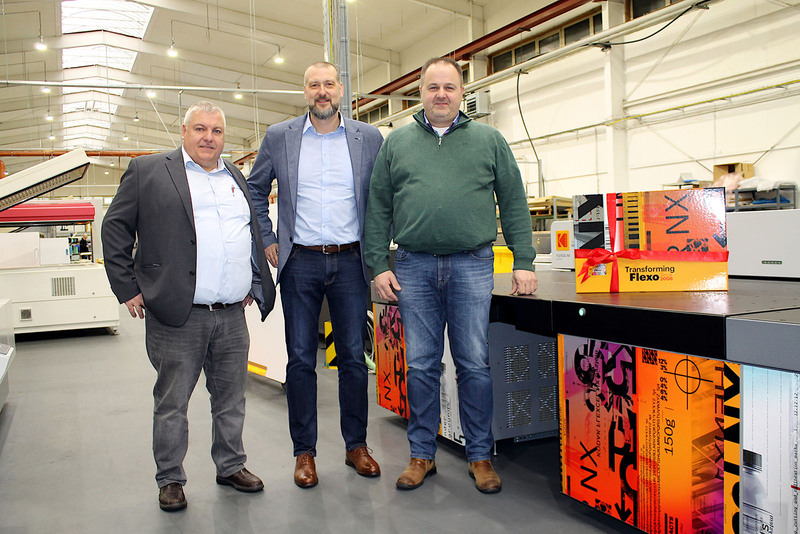 Five years after KODAK FLEXCEL NX Plate technology made its debut at U. Günther GmbH with the acquisition of a KODAK FLEXCEL NX Wide 5080 System, a second line of the same type was commissioned in November 2018. U. Günther is now the first Kodak customer in Europe to use two of these large-format systems to make high-resolution, high-performance flexographic plates in 1270 x 2032 mm size. Established in 1968 by Ulrich Günther, this family owned Hamburg firm currently employs around 125 people. The portfolio covers everything from consulting through packaging design, artwork and mock-up production, reproduction and platemaking for any letterpress application to print production support on behalf of brand owners and retailers. Early in 2016, rapid growth prompted the decision to transfer the company’s entire platemaking operations to Greven, about 35 miles to the east in Mecklenburg-West Pomerania. Twenty-five percent of U. Günther’s turnover is generated with international clients, with business not confined to Germany’s immediate neighbors but as far afield as Greece, Israel, North Africa and Turkey. At U. Günther, flexo dominates platemaking with 85% of all plates produced; the remainder are letterpress and offset varnish plates. Among the flexo plates, paperboard and corrugated postprint account for 50% of the total surface as opposed to 35% for flexible packaging and 15% for labels. The packaging prepress service provider uses FLEXCEL NX Plate technology for all of these flexo applications alongside various LAMS systems and a direct laser engraving system. Tarnowski is equally enthusiastic when it comes to the FLEXCEL NX System’s printing properties: “The ink laydown is very homogeneous and we can control it in a targeted way using the special advanced KODAK DIGICAP NX Patterning. We conduct tests upfront to determine which DIGICAP Patterning best matches the combination of press, anilox rollers, inks and substrate. That way, we can deliver FLEXCEL NX Plates that convince the customer all round with good ink laydown, optimally controllable dot gain and excellent printing results.” U. Günther uses FLEXCEL NXH Plates for flexible packaging and labels as well as FLEXCEL NXC Plates for corrugated printing in every conceivable thickness from 0.76 to 3.94 mm. As far as screen resolution is concerned, the prepress experts manage up to 200 lpi with FLEXCEL NXH Plates and up to 150 lpi with FLEXCEL NXC. The volume of plates manufactured has increased steadily since the first FLEXCEL NX System was installed five years ago. Today, 25% of all photopolymer flexographic plates made by U. Günther are FLEXCEL NX, and the figure is still rising.